It goes without saying that we love our own businesses, but how passionate are you about the focus of your business online? You may have a thriving business offline, but perhaps you’ve not explored the benefits of online business and how you can plugin to engage with people online, or perhaps you have not been able to invest the time and effort in getting your brand, website or advertising working to its best. 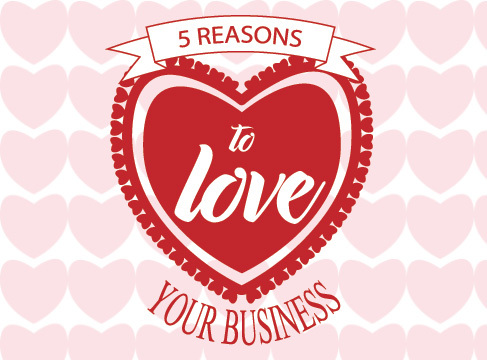 Read the following 5 reasons why you should love your business online. This blog post focuses on people who have a website but don’t really use it to its potential online. Do you really love your website? This is a vital question as if not, why would you want to send people to it and promote it if the website is outdated, doesn’t reflect who you are and doesn’t have the correct information. The chances are if the above is correct, customers won’t like your website either. A. Ensure your logo is up to date and your brand colours are reflected in the website. B. Take some quality time evaluating your content and bring it up to date. If point 1 is adhered to, then the next step is to aim to provide content that’s not just relevant to that page, but that sort of guides them through to the point of you adding a call to action for them to enquire online. You have time to think better when providing online information as opposed to on the fly talking over the phone so your content can be much deeper online. Plugging into this way of working can give you better conversions. Your website can capture, track and report on any activity coming from your website, email newsletters, social and referring visitors to your website. Goals are an essential way online to measure specific actions of a visitor, whether a click on a link or submit a contact form or download a file. Measuring success offline requires more paperwork and time to measure the success of the business, but online you can capture visitors and how many people of those enquired and converted into a sale. Outreaching to new business is much easier online with useful tools and apps available. You could setup an email marketing campaign to outreach to relevant businesses which again is measured in how many people open the email or subscribe to an email newsletter. It’s essential also to outreach to people on social media, especially as its free to access and can really help engage a wider audience. Target people of a specific demographic, so male and female from 30 – 55 for example. Through tracking tools, measure how many clicks you got that led to visitors to your website. Measure how long they stayed and how much revenue that generated. Once offer expires, delete or pause those adverts.